Blog DOES YOUR “GOD” EVER DISAGREE WITH YOU? “Over the last four and a half years, since planting what is now known as The Response Church, I have found that God has lovingly disagreed with me on several issues. Allow me to share seven of these issues with you. I began the church as an egalitarian, convinced that God desired local churches to appoint female elders and that husbands were not called to be loving sacrificial leaders in their homes. Eventually our church transitioned to complementarianism because of clear conviction from the Scripture. The only reason I held an egalitarian position in the first place was because I was also holding another view that was far more dangerous. I was holding a low view of the inherency of the Bible. I realized that I didn’t really trust in the sufficiency of God’s Word. I also held a much lower view of eldership in general. I neglected the requirements that were clearly laid out for me in 1 Timothy chapter 3 and Titus chapter 1. I did this subconsciously thinking that I knew what “my” church needed more than God did. I also didn’t believe church membership to be biblical and necessary until just about three years ago. As a result, dozens of people fell through the cracks during the first couple years of ministry. These people were never really able to plug into our church and therefore never received the loving discipleship they should have. Eventually these people left. By God’s grace, we now have a healthy and robust process for church membership as well as helpful systems of discipleship for those who become members. The elders and I have also radically increased the percentage of finances that our church gives towards church planting, both locally and globally. We recognized that we were far too inward focused in the ways we used God’s money. Perhaps one of the most impactful changes was that I helped to lead our church in the process of changing affiliations. Our church began as a part of a network of churches that held a low view of biblical inherency and chose not to center on the gospel. Thankfully, we are now officially a part of the Acts 29 Network. Due to this transition there is now far more accountability for myself and our other elders. Lastly, I have continued to grow in my understanding as well as my prioritizing of the gospel in my preaching. I continue to realize more and more that there really is a huge difference between being a good speaker verses being a good preacher. 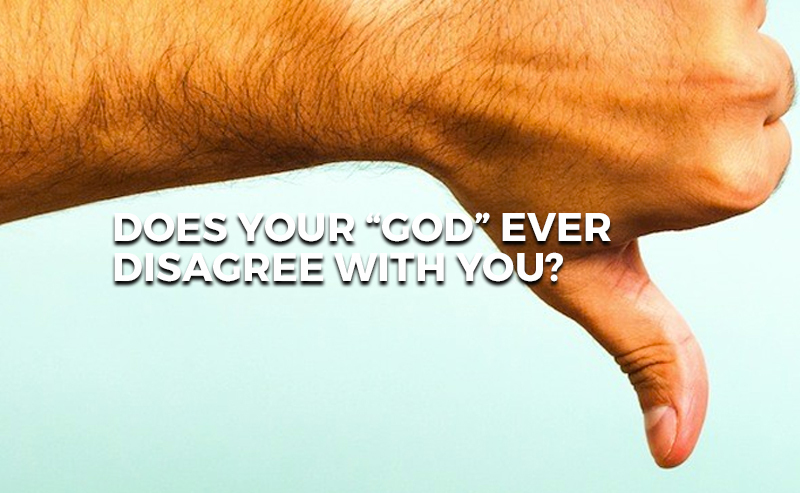 Has your “god” ever disagreed with you? If so, what is God currently disagreeing with you about? Lastly, what are you doing to change/repent?